Group of synthetic organic chemists at Kaunas University of Technology (KTU), Lithuania have synthesised a new material, which can be used as a detector of cyanides in water. In contact with cyanides it changes colour in half a minute – more than 20 times faster than currently used colorimetric commercial cyanide detection products. Discharges from metal finishing industries, iron and steel mills, and organic chemical industries are among the major culprits of cyanide releases to water. Chlorination treatment of some wastewaters can produce cyanides as a by-product. Also, cyanide is produced naturally by over 1,000 plant species, among them sorghum, bamboo shoots and cassava. Relatively low concentrations of cyanide can be highly toxic to people and wildlife. “Some regions are more susceptible for cyanide contamination in water than others. For example, among the potentially dangerous natural sources of cyanide is cassava, which in South American countries is used for food, and which can be poisonous if not properly prepared. 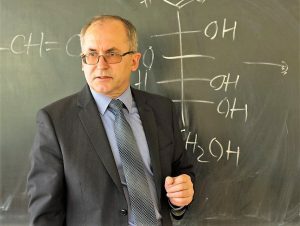 Also, the waters used in mining industries have to be checked from cyanide as it is being used in the extraction of gold and silver”, says Professor Vytas Martynaitis, researcher at KTU Department of Organic Chemistry. The compound synthesised by a group of researchers of KTU Faculty of Chemical Technologies could be of use in situations, where cyanide poisoning is likely. The new material reacts to cyanides: it changes colour almost instantly after exposure to the toxic substance. “Our compound is faster than other researched and commercially used colorimetric substances. While currently used in the market cyanide detectors’ reaction time is 20 minutes, our compound gives out colour upon detecting cyanide in half a minute”, points out Martynaitis. In contact with cyanides, one of the synthesised compound’s bonds dissociates and nitrophenolate, which is giving out the colour, is formed. 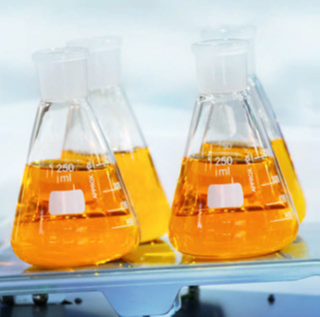 Comparing with the similar substances currently used in cyanide detection products, the compound synthesised in KTU laboratories is more than 20 times faster. The research group has synthesised the new material, which can have numerous applications: for example, if integrated with polymer, the cyanide detector could be presented in a form of a testing strip, which immediately changes colour if the water contains traces of cyanides. The substance synthesised by KTU chemists “Spiro[chroman-2,2″-indole] derivatives as cyanide ion chemo sensors” has been recently patented by European Patent Office (EPO). Commercialisation of the invention is facilitated by KTU National Innovation and Entrepreneurship Centre – one stop shop for knowledge intensive business to contact research.